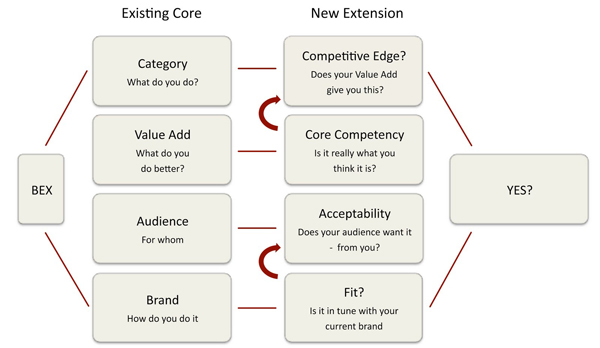 Joanna Allen, CD at Savvy&Victor, use this model to help clients evaluate and determine the direction of a brand extension into a new category e.g a new product or service. I mainly aims to establish the core capability of the existing brand to give the clients a competitive edge within their new area of development. It also incorporates the audience perspective, which often can be quite different to the organisations. Gerber Singles is an exellent proof of that. I did know about Virgin and that Virgin has several subbrands. When I found this pic on the blog Ideas Inspiring Innovation I was overwhelmed though. I will do some research on how many of these brands actually exists today. This is a good case on how to make more money on your brand without letting go of your core values.